I had a little problem with my scheduling today...and almost missed seeing a movie. I was all set to see Nick and Nora at 1:40 p.m. So I wandered up to the box office, bought my ticket with my last gift certificate from JJ....specifically asking for a ticket to see Nick and Nora. When I gave it to the ticket taker guy, he said I couldn't go in because I was two hours early! Evidently the movie was at 1:10, not 1:40. So I threw a hissy fit asked what else was about to start...my choices were: Billy: The Early Years, Lakeside Terrace, and The Duchess. I almost decided on The Duchess, but the two ticket taker guys told me Lakeside Terrace was really spectacular. 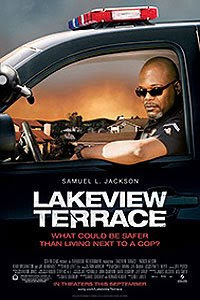 I love Samuel L. Jackson in a good way, but I'm not much for violence...but, so be it, I would try not to close my eyes, and stick my fingers in my ears and go, la la la la la. I would tough it out. Just for my readers...especially Colin who is critical of my usual choice of movies. and even harder on his new neighbors. They are a racially mixed couple and this doesn't sit well with Abel. He launches a reign of terror that is hard to figure out. He bounces around from being a good neighbor to being a spooky raging sociopath. Just when you want to like him he flips. This movie is full of suspense, and has quite a few twists and turns. The plot is very unpredictable, and I recommend it if you like suspense. It's rated PG13, but I think it's more R.
Can you tell this isn't my type of movie? 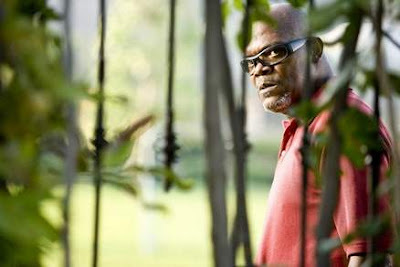 I like Samuel L Jackson too. I hate violence too! I'm just like you. yAy! Yeah, I am not into violent movies either. Sam J is a good actor though. I can't believe you were off on your times....are you still on CA time???? Hmmm! Maybe I'll rent it. How many stars? This is the movie my husband wants to see. I told him you didn't like it. He said "who cares". Men are so...ummm yeah, that.